Emergency situations are, by their very nature, unexpected. The best way for businesses and other organisations to prepare for such a situation is to perform drills so employees can learn what actions to take in the event of an evacuation. There must be guidelines in place so everyone can be evacuated smoothly and without extraneous stress; the use of a fire safety log book will help you set down the appropriate fire safety policy. The use of fire exit signs, such as fire exit left signs, will ensure everyone can quickly and safely find their nearest fire exit. Fire exit left signs clearly indicate what direction to take during a fire drill or emergency. Placing them prominently in appropriate locations is of the utmost importance in providing the people who use your premises with the information required to quickly exit during an emergency without coming to any harm. 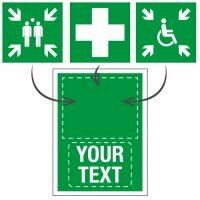 Fire exit left signs are available in a variety of materials, including polyester and rigid plastic. The type of material best for your needs will generally depend on your working environment. If the risk of damage to your signs is high, we recommend you take advantage of our fire exit left signs with an anti-vandal finish. These are treated with a clear gloss overlaminate film that protects against graffiti and UV fading, ensuring your notices are clearly visible for at least ten years. See our guide to signs materials for more information on the materials available. Other options in our range include photoluminescent fire exit left signs, which meet the regulatory requirements for Photoluminescent Safety Products Association (PSPA) Class B, the German Institute of Standardisation (DIN) and the International Maritime Organization (IMO), as well as British Standards. Nite-Glo fire exit left signs stay illuminated for around six hours once they have been activated by a source of light. These signs are particularly useful in the event of a power cut or when smoke is obscuring vision. 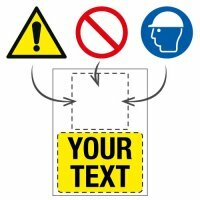 Put simply, these signs save lives, and you can help to ensure the safety of your employees and visitors by selecting the appropriate signage for your working environment. Use fire exit left signs in conjunction with other fire safety signs and products to ensure compliance with fire safety regulations. For example, use fire action notices to highlight the correct actions to take in the event of fire and fire assembly point signs so that people know where to congregate once they have safely evacuated the building or site. Discover our whole range of fire exit signs for more options to suit your needs. If our fire exit left signs don’t meet your specific requirements, we also offer custom safe condition signs. These are signs you can design yourself using our online custom sign design service, creating a sign tailored to your needs. It is simpler than you may think, taking only five steps to get a sign that is unique to you. For those signs that are not supplied with an adhesive backing, then some form of secure fixing is required. Screws are ideal for rigid plastic and metal signs. For signs that could be tampered with, then the use of security fixings are advised – these screws cannot be undone with a conventional screwdriver. If the surface is uneven, then our permanent adhesive is ideal. It is UV and weather resistant with high adhesion properties. What’s more, it is suitable for use both indoors and out.